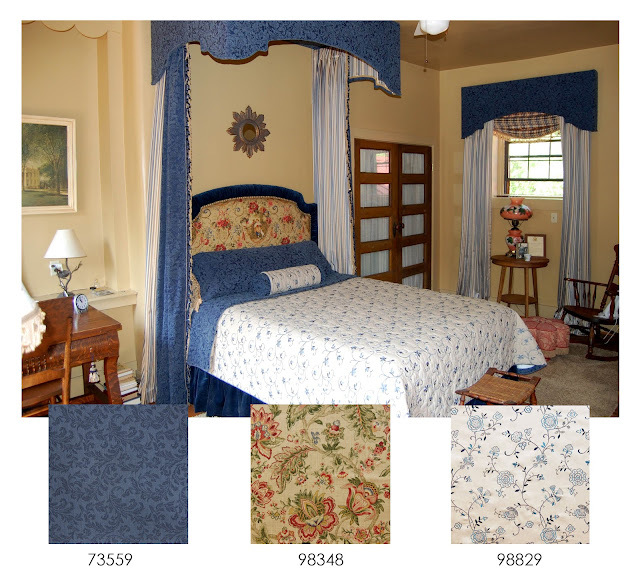 This beautiful and traditional look was created by a designer located out of Waynesburg, Pennsylvania. Charlotte Connors from Charlotte’s Custom Draperies says, “This Master Bedroom is near and dear to my heart because my husband and I were the customers!” It may not be apparent by the photos, but there were great challenges in the design of the room because it is in a 170 year old house with lath and plaster applied over the fieldstone walls and tree trunks were used for the ceiling joists. 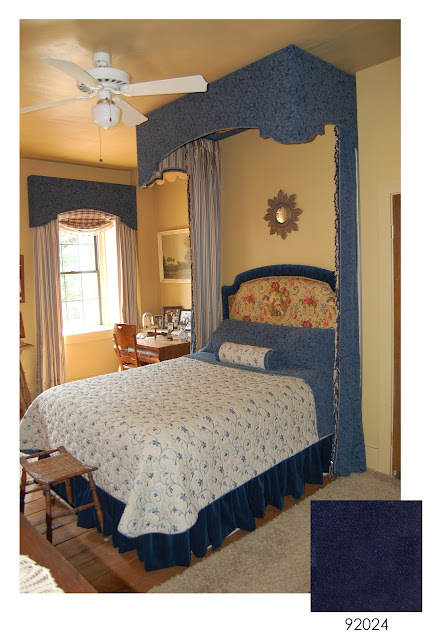 She took a favorite cornice design and made it into a corona and upholstered it in a royal blue chenille fabric. It took three men to hold it in place while it was mounted to the ceiling! The liner was then attached on the inside with velcro. The below headboard was upholstered with a colorful toile to bring in a pop of red to the room. It was then outlined with a gold gimp and a row of nail head trim to give it the traditional and sophisticated look you see throughout the room. The bed skirt was made out of one of our royal blue velvets and the bedding is an embroidered quilted linen with a cord edge. When the window cornices were mounted, in order to not disturb the plaster, they attached a board to the existing trim and used angle irons. 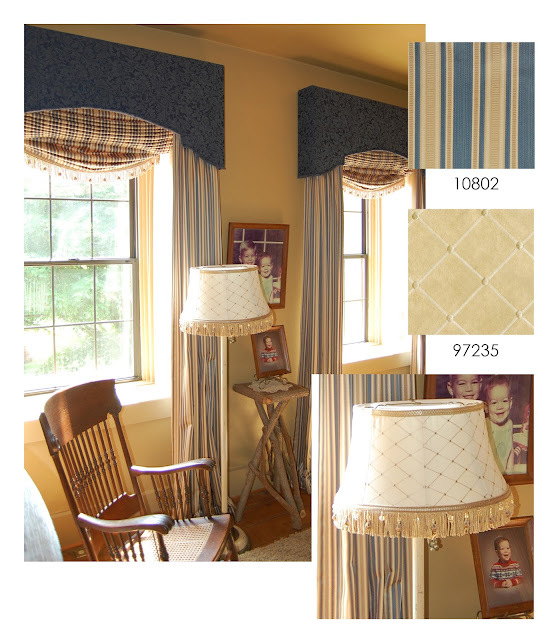 She then used one of our beautiful blue and gold stripes for the window drapes and shades for the room as well as the lining of the bed drapes. All of the trims on the windows and the lampshade are a layer of bullion fringe plus a trim of beading. If you would like a similar look, check out our fabrics paired with the images.